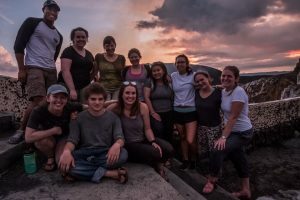 Students journey to Nicaragua immediately following Spring semester on a three-week immersion experience. They explore the political and justice issues of Latin America through this program with Carpe Diem Education and Seeds of Learning. Participants learn about fair trade coffee, volunteer in rural communities, and meet leaders who work for justice and peace. The experience may include homestays with campesinos, service in neighborhoods, and presentations by local experts on topics such as fair trade, foreign policy, human rights, and other social justice issues.